WASHINGTON, DC -- The United States is condemning an outbreak of violence in eastern Ukraine, calling it the deadliest 24-hour period so far this year. Ukraine's military says nine soldiers have died in the east where Ukrainian forces and Russia-backed rebels have been fighting for more than three years. 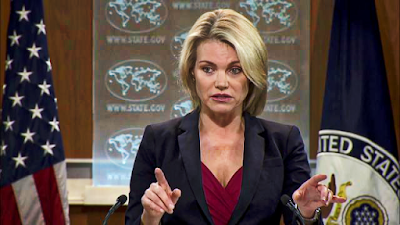 State Department spokeswoman Heather Nauert says that five deaths were in clashes that appear to have been initiated by what she described as Russian-led forces. Nauert says the U.S. is asking the Russia-supported troops to abide by the terms of a cease-fire deal for eastern Ukraine that was signed in early 2015 but never fully implemented. She says the U.S. calls on those forces to allow international monitors to have "full, safe and unfettered" access to the conflict zone.